Rosemary is an evergreen perennial plant which can be harvested all year round. It produces small pretty blue flowers in the winter and early spring. A good time to prune rosemary into shape is after it has flowered. Rosemary can be used fresh or dried. It is an evergreen plant so using it fresh is easier and preferable. You can either strip off the leaves from the woodier stems or use whole sprigs to flavour your food then remove them. The leaves and flowers of rosemary can be used in many different dishes; here are just a few ideas to whet your appetite. However, remember that rosemary has quite a strong flavour so you don’t need to add very much even in dishes that are slow cooked. • The flowers can be used in desserts eg sprinkled over ice cream or mousses. 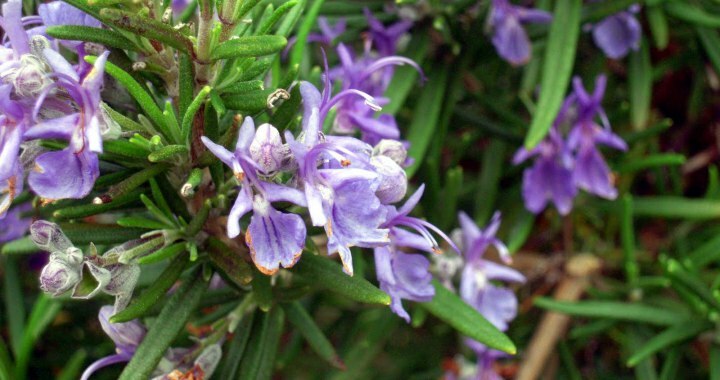 • Rosemary blends especially well with oranges but also other fruits. An orange fool flavoured with rosemary is lovely. • You could also make Rosemary Syrup. • One of the more traditional uses for rosemary is as an accompaniment to lamb dishes. If you blend rosemary leaves, garlic, lemon juice and seasoning and marinate your lamb before cooking it will taste delicious. This also works for chicken and pork dishes. • Use sprigs for roasting, grilling or on the barbeque. • Another combination for lamb is to mix rosemary leaves with orange to create a glaze but some people may find this a bit too sweet. • The fresh shoots can be used to flavour olive oil or milk/cream or syrup to be used in puddings. Also delicious added to lemonade and other summer drinks. • Onions roasted with rosemary and made into a sauce is also tasty. • You can make rosemary flavoured oil or vinegars. • Adding rosemary to roast potatoes is another popular use and is one of my favourite ways of using it. • Make skewers from stripped, longer, stronger sprigs (soak in water before cooking) or use as they are as a basting brush. • Makes a wonderful oil and vinegar. Great for marinades. • Add finely chopped leaves to soups, sauces, salads, pasta and bread such as foccacia. • Rosemary combines well with any of the following herbs: bay, chives, garlic, lovage, mint, oregano, parsley, sage, savory and thyme. • An essential part of ‘herbes de provence’. Posted in Culinary and tagged cooking, flavour, fresh, vegetables.